LONDON: WikiLeaks founder Julian Assange’s nearly seven-year hideout in Ecuador’s London embassy abruptly ended yesterday when police entered the building and arrested him ahead of possible extradition to the United States. Footage shot by the Russian video news agency Ruptly showed a frantic-looking Assange-his worn face framed by a large white beard and shock of grey hair-being huddled out of the building by plain-clothes security officers and pulled into a waiting police van. A Ruptly reporter who shot the scene and requested anonymity told AFP that Assange shouted “UK must resist” as he was being dragged into the van. Assange has been living at the embassy in London’s plush Knightsbridge district since 2012 when he sought refuge there after being accused of sexual assault in Sweden-allegations that have since been dropped. A British police statement said Assange was then “further arrested on behalf of the United States authorities, at 10:53 hrs after his arrival at a central London police station. 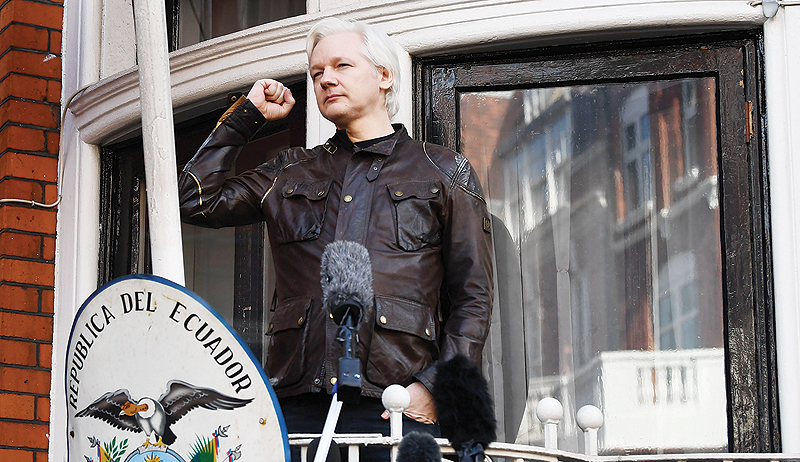 “This is an extradition warrant under Section 73 of the Extradition Act.” WikiLeaks accused Ecuador of breaching international law by withdrawing his asylum. “Ecuador has illegally terminated Assange political asylum in violation of international law,” the whistleblowing website said on Twitter. Assange is wanted by Britain for violating prior bail conditions-a minor charge that WikiLeaks fears will be used as a pretext for extraditing him to the United States. There he potentially faces a far more serious case linked to the publication of classified US defense material. Britain’s Europe and Americas minister Alan Duncan said London was “very grateful to the government of Ecuador under president (Lenin) Moreno for the action they have taken”. Moreno himself said that he had “asked Great Britain for the guarantee that Mr Assange will not be extradited to any country in which he could suffer torture or face the death penalty”. “The British government has confirmed this in writing,” he said in a video message. The United States applies the death penalty in both federal and state courts. Treason charges are punishable by death in times of war-but Washington has refused to confirm reports that it had indicted Assange on unspecified charges. Ecuador’s former leader Rafael Correa called Moreno “the greatest traitor in Ecuadorian and Latin American history”, who has committed “a crime that humanity will never forget”. Assange’s case has opened up explosive debate about security and free speech. His supporters view him as a crusader who fearlessly exposes injustices such as torture and alleged war crimes committed by the United States in Afghanistan and Iraq. The 47-year-old Australian’s critics accuse him of cosying up to authoritarian leaders such as Russian President Vladimir Putin and putting Americans’ lives at risk. Fugitive former US government contractor Edward Snowden-himself wanted for leaking details of secret US surveillance programs-called Assange’s arrest a “dark moment for press freedom”. Russian foreign ministry spokeswoman Maria Zakharova accused Britain of “strangling freedom”. Assange’s mother Christine tweeted that she had been advised that her son faces up to 12 months in a British prison. “Our focus is as always to STOP a US Extradition!” she wrote. Assange’s lawyer Jennifer Robinson also raised the possibility of her client being sent to face US justice. “Just confirmed: #Assange has been arrested not just for breach of bail conditions but also in relation to a US extradition request,” Robinson tweeted. Assange is due to appear in a London court later Thursday and Australia has requested consular access. WikiLeaks on Wednesday had claimed that it was being blackmailed by “dubious characters” who had obtained security camera footage of Assange inside the embassy. WikiLeaks editor Kristinn Hrafnsson accused Ecuador authorities of gathering the images as well as copies of private documents prepared for Assange by his lawyers. Hrafnsson said these had then found their way into the hands of a group in Spain that was demanding $3 million not to publish them.